Keith Isley, a six-time PRCA Clown of the Year, returns to the Chisholm Trail RAM Prairie Circuit Finals Rodeo as the featured entertainer and barrelman for the regional championship, which takes place Oct. 18-20 in Duncan. 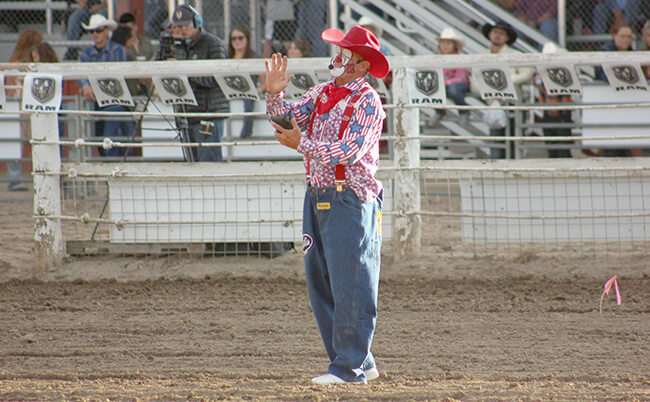 DUNCAN, Okla. – Keith Isley is one of the most decorated clowns in rodeo. Now Isley will bring his brand of funny to the Chisholm Trail Ram Prairie Circuit Finals Rodeo, set for 7:30 p.m. Thursday, Oct. 18-Saturday, Oct. 20, at the Stephens County Arena in Duncan. “I thoroughly enjoy watching people have a good time and enjoy what I do or what I say,” said Isley, 60, now in his 25th year in ProRodeo. “Just seeing people enjoy it and have a good time. Sometimes later in the year, you’ll get home and have some letters for you and have some pictures of you that kids have drawn. Those are just a few pieces of the puzzle that makes Isley such a commodity. In addition to being one of the best funny men in the business, he also has some of the top acts in rodeo. He’ll bring it all with him when he arrives at the southern Oklahoma.